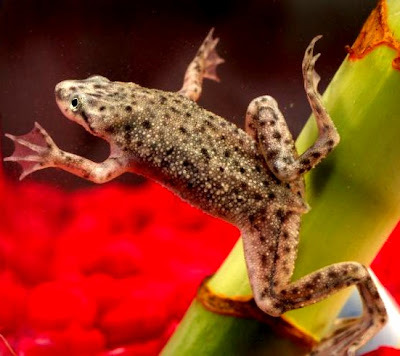 African dwarf frog is an ideal pet for keeping in ornamental fish bowl as it is miniature in size and grows up to a maximum of 2½ inches in length. Ornamental African Dwarf frogs are very much suitable for an ornamental fish bowl. They can be kept along with adult guppy fish or ghost shrimp in fish bowl. Alternatively a pair of them can be kept in a large ornamental fish container. These ornamental African dwarf frogs (Hymenochirus boettgeri) come under the genus Hymenochirus. These are very commonly mistaken for African clawed frog (Xenopus laevis). African clawed frogs are banned species in many States due to threat to native populations. However they can be differentiated easily by their main characteristic of front feet. The front claws of African clawed frog have no web between the digits whereas the African dwarf frog has web between the front feet digits. These ornamental dwarfs are tongueless and toothless and lead a complete aquatic life. However they surface to breathe and have lungs. They live up to 10 years in ideal conditions in a fish bowl. These are native of Africa living in the tropical and subtropical areas of Congo region. These ornamental dwarf inhabit the shallow rivers, streams and ponds. They lack true ears and use the lateral lines running down their bodies to pick up sounds and vibrations. The ornamental fish container must have secure cover as they may jump out of the water. As they are very active and may churn up the bottom, it is preferable to keep an airlift filter. The pH of the water may be closer to neutral. The optimum temperature of water for these ornamental pets is between 65°F - 75°F. A hiding place may also provided for the ornamental pets as they prefer to hide while moulting in the ornamental fish container. It is advised not to keep gravel in the ornamental fish bowl as the pet may swallow gravel and it may get stuck in the stomach. River sand may be used as substratum. As Chytrid Fungus, a deadly amphibian fungus, can affect the African dwarf frog at the pet shop level, it is preferable to quarantine the new frogs for least 3 months before introducing them to other aquarium pets in the ornamental fish bowl especially frogs. As they do not have teeth or tongue, they swallow food as whole, sometimes using their claws to tear down the feed. Young frogs may be fed twice a day. As they grow they can be fed once daily. The size of the feed must be small enough for swallowing. If fish are also kept we may have to watch whether the African dwarf frog is also getting the feed in the ornamental fish bowl. As the eyes of the African dwarf are located on far sides of the skull it has difficulty in locating food. Pellets, flakes, blood worms and frozen meat can be given. The male African dwarf is smaller than the female and when mature develops a pink or white spot behind its armpits. Mature male ornamental African dwarf frog may start singing in the fish bowl. The females dwarfs appear more rounded and much bigger than the males. The mating in African dwarfs is called amplexus wherein the male holds the female around the abdomen in front of female's hind legs. Female lays the eggs on the surface of water and as she lays eggs the male fertilizes them. Sudden increase in water level and its warmth induces the female to produce eggs. Proper feeding of female with protein food must be done for getting the female to maturity. The female may release about 500-700 eggs. The parents must be separated as they may eat the eggs as well as hatchlings. The eggs hatch after 3-4 days depending upon the water temperature and the tadpole are to be fed with infusoria or microworms till they are big enough to eat worms and baby brine shrimp. In about 8 weeks they will metamorphose into tiny dwarfs of about 12mm length. You may have to shift the young African dwarf frogs from the ornamental fish bowl to a bigger aquarium for space for their further growth.